Soekarno-Hatta International Airport (IATA: CGK, ICAO: wiII) is a major airport serving the city of Jakarta on Java island, Indonesia. The airport is named after Indonesia's first president, Sukarno, and first vice president, Mohammad Hatta. 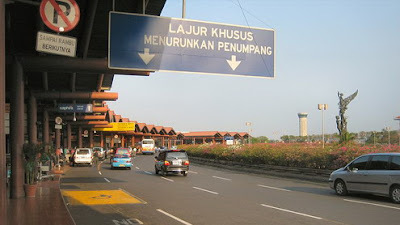 The airport is often called Cengkareng, and became its IATA code, namely CGK. It lies about 20 km west of Jakarta, Tangerang District, Banten. It began operations in 1985, replacing the Kemayoran Airport (domestic flights) in Central Jakarta, and Halim Perdanakusuma in East Jakarta. Kemayoran Airport has been closed, while Halim Perdanakusuma Airport still operates, charters and military flights. Terminal 2 opened in 1992. 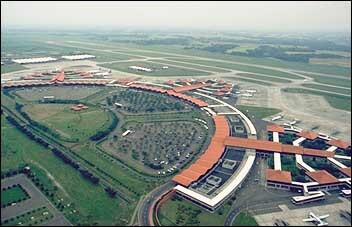 Soekarno-Hatta has an area of ​​18 km ², has two runways that are separated by two parallel taxiway along the 2.400 m. There are two main terminal buildings: Terminal 1 for all domestic flights except flights operated by Garuda Indonesia and Merpati Nusantara Airlines, and Terminal 2 serves all international as well as domestic flights by Garuda and Merpati. 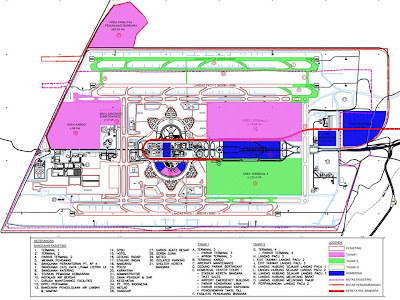 Each terminal building is divided into 3 concourses. Terminal 1A, 1B and 1C are used (mostly) for domestic flights by local airlines. Terminal 1A serves flights by Lion Air and Wings Air. Terminal 1B serves flights by Kartika Airlines and Sriwijaya Air. While serving the aviation terminal 1C by Airfast Indonesia, Batavia Air, and Citilink. Terminals 2D and 2E are used to serve all international flights airline outside. Terminal 2D to all foreign airlines that are served by PT Jasa Angkasa the Universe, one airport ground crew. 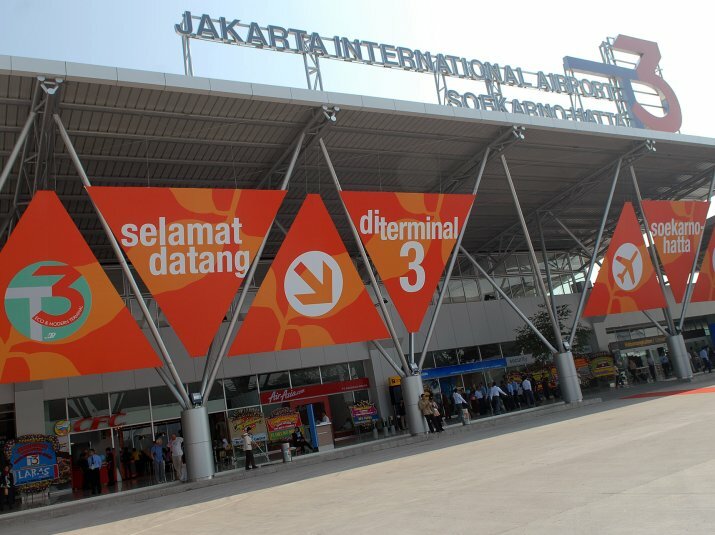 Terminal 2E for international airlines are served by Garuda, including all international airline Garuda and Merpati. Terminal 2F for domestic flights of Garuda Indonesia and Merpati Nusantara Airlines. Terminal 3 was completed on April 15, 2009. Terminal 3 is completed will be used by low-cost airline planned to accommodate aircraft and Airbus A380 models. The airport was designed by French architect Paul Andreu, who also designed the Charles de Gaulle airport in Paris. One of the major characteristics of this airport is its local architectural style, and tropical garden between the waiting lounge. However, due to lack of maintenance, the location is not strategic and less revenue, the airport is lower than other international airports in the area. Soekarno-Hatta International Airport has 150 check-in counters, 30 baggage claim and 42 gates. Each sub-terminal has 25 check-in counters, 5 baggage claim and 7 gates. Angkasa Pura II is planning a new terminal building with modern design features. Terminal 3 was built for low cost carriers. There is a great plan to build 5 + 1 passenger terminal Haj terminal and 4 runways. The airport is planned to connect with Manggarai station, but this plan still unclear fate. The airport tax charge amounting to Rp 100,000 ($ 9 USD / 8 Euro) for each international passenger and Rp 30,000 for each domestic passenger. Between 1928-1974, Kemayoran Airport destined for domestic flights is considered too close to military bases Indonesia, Halim Perdanakusuma Airport. Civil aviation in the area to be narrow, while air traffic increased rapidly, which threatens international traffic. In the early 1970s, with the help of USAID, eight potential sites were analyzed for new international airports, namely Kemayoran, Malacca, Babakan, Jonggol, Halim, Curug, Tangerang Tangerang South and North. Finally, North Tangerang Jonggol selected and marked also can be used as an alternative airport. Meanwhile, the government started to upgrade to Halim Perdanakusumah Airport to serve domestic flights. Between 1974-1975, a consortium of Canadian consultants include the Aviation Planning Services Ltd., ACRESS International Ltd.., And Searle Wilbee Rowland (SWR), won the bidding for new airport project. Lessons begin on February 20, 1974 with a total cost of 1 million Canadian dollars. One-year project was approved by the partners from Indonesia, represented by PT Konavi. At the end of March 1975, this learning approve development plans third runway, road asphalt, 3 international terminal building, 3 domestic terminals and 1 terminal Hajj. Three storey domestic terminal was built between 1975-1981 at a cost of U.S. $ 465 million and a domestic terminal, including aprons from 1982-1985 at a cost of U.S. $ 126 million. A new terminal project, called the Jakarta International Airport Cengkareng (code: JIA-C), begins. 1975 - 1977: To open the land and it takes time to set the border provinces. Amsterdam Schiphol was asked his opinion of which according to them rather expensive and overdesign. The cost increase due to the use of decentralized systems. Centralized system to be the best. The team is still using a system of decentralization. Initial system Orly Airport West, Lyon Satolas, Hanover-Langenhagen and Kansas City used because it is simple and effective. 12 November 1976: Invitation to Tender to the French consultant with the winner Aeroport de Paris. May 18, 1977: Contract signed between the Government of Indonesia akgir by Aeroport de Paris at a cost of 22,323,203 francs and USD 177.156 million which is equivalent to 2,100,000 francs. The time needed for the job is 18 months, and the government appointed PT Konavi as local partners. • asphalt road: 1 in the east, the other in the west to the airport service. West road was closed to the public. • Garden at the airport was chosen as an illustration. May 20, 1980: Work begins with the cost for 4 years. Sainraptet Brice, SAE, Colas and PT Waskita work as a builder. December 1, 1980: Government of Indonesia signed an agreement valued at USD 384.8 billion with the builder. The cost structure reached USD 140 450 513 000 from the state budget, 1,223,457 contributed by the French franc and U.S. $ 15,898,251 from the government. December 1, 1984: The airport is physically complete. May 1, 1985: The second terminal started construction on May 11, 1992. On December 23, 1986, Presidential Decree No. 64 of 1986 concerning the control of air and land in the vicinity of Soekarno-Hatta Airport issued.